Learn about Hokkaido island: its location in Japan, its geography, its world-class unique features, its seasons, and the budget needed for a stay there! 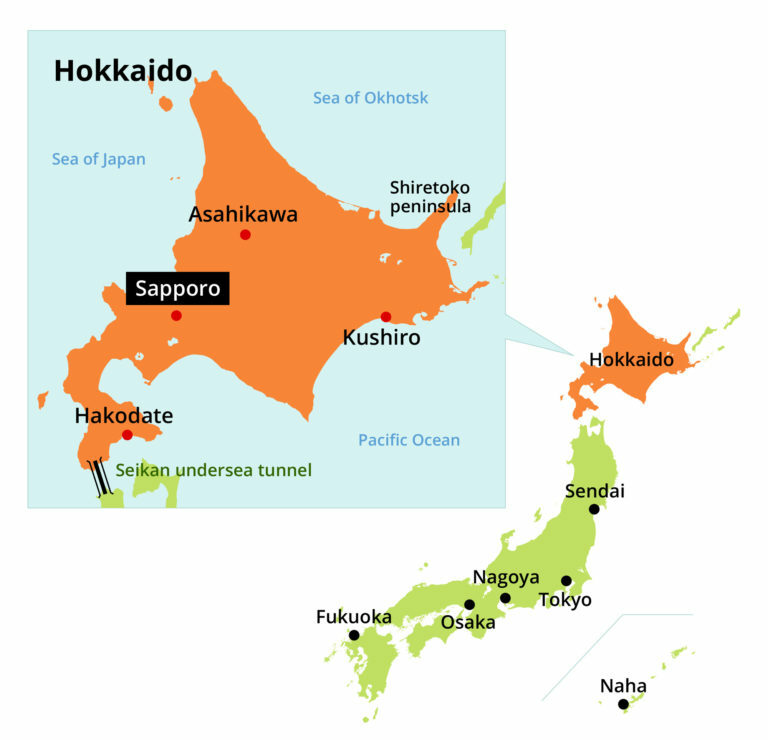 In Asia, Hokkaido is Japan’s biggest island and prefecture; it covers 22% of Japan’s land area, equivalent to Ireland or South Carolina. Most north-eastern Japanese prefecture, it is surrounded by the Sea of Japan (west), Sea of Okhotsk (north-east) and Pacific Ocean (south-east). The regional capital Sapporo (43°N like London) is 515 miles (830 km) north-east from Tokyo (35°N like Santa Fe) so their climates and ways of life are very different. In Hokkaido, cold winds and heavy snow come from nearby Russia’s Siberia (Vladivostok is 435 miles i.e. 700 km west) whereas snow is rare in Tokyo. On the contrary, typhoons are common on the mainland but rare in Hokkaido: they do not come that north or weaken so much that few are worrisome. Hokkaido features impressive mountains and peaks, the highest being Mount Asahi (7,513 feet i.e. 2,290 m), and a few look like Mount Fuji: Mount Rishiri (aka Rishiri-Fuji), Mount Yotei (aka Ezo Fuji)… The nearby Japan Trench part of the Pacific Ring of Fire lets you see active volcanoes and relax in diverse natural hot springs surrounded by mountains, under a starry sky, while watching the sunrise, after skiing, or after hiking! Unique in the World, Unique in Japan? Destinations recognized by UNESCO: Shiretoko world heritage, Mt. Apoi geopark, and Toya Caldera & Usu Volcano geopark. Akan Mashu National Park with its extremely rare marimo moss balls. Seikan Tunnel, world’s deepest & longest undersea tunnel. Ancestral land of Ainu indigenous people, who live close to nature and who have their own language, culture and religion. Japan’s largest national park (Daisetsuzan), largest marshland (Kushiro Wetlands), most impressive lavender fields (Furano-biei), jewelry ice, and local animals different from those on the mainland. Outdoor activities such as dog sled races, horseback riding on snow, and ice diving. Seasons different from the mainland. You can enjoy the four seasons in Hokkaido. Spring & autumn are very comfortable but quite short, summer is warm but much less humid than on the mainland, and winter is long! The temperatures vary much depending on the elevation, distance to the sea, and time of the day/night. Air conditioning is typically available at hotels, shopping centres, etc. so there is no problem even during the coldest & hottest periods. Period to ski and see tancho cranes. New Year is a very important celebration for Japanese people, typically spent with the family (similar to Christmas in Europe and America) so many restaurants & shops close for several days. Most convenience stores remain open so no need to worry in big cities but plan well if you spend New Year in the countryside. 20: Seijin-shiki-no-hi Coming Of Age Day is when Japanese young adults celebrate their 20th anniversary. It is a great opportunity for you to see Japanese young women wearing a kimono and fur accessories! Period to ski, see tancho cranes, enjoy drift ice cruises, and enjoy drift ice walking tours. Asahikawa Winter Festival in Asahikawa city. Japan Cup Dogsled Race in Wakkanai city. Jewelry Ice (also known as Tokachi river ice) at Toyokoro town. Lake Shikaribetsu Kotan event during which an ice village is built on the frozen lake Shikaribetsu. 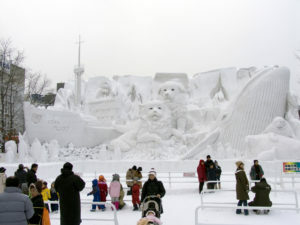 Mombetsu Drift Ice Festival in Monbetsu city. Okhotsk Drift Ice Festival in Abashiri city. 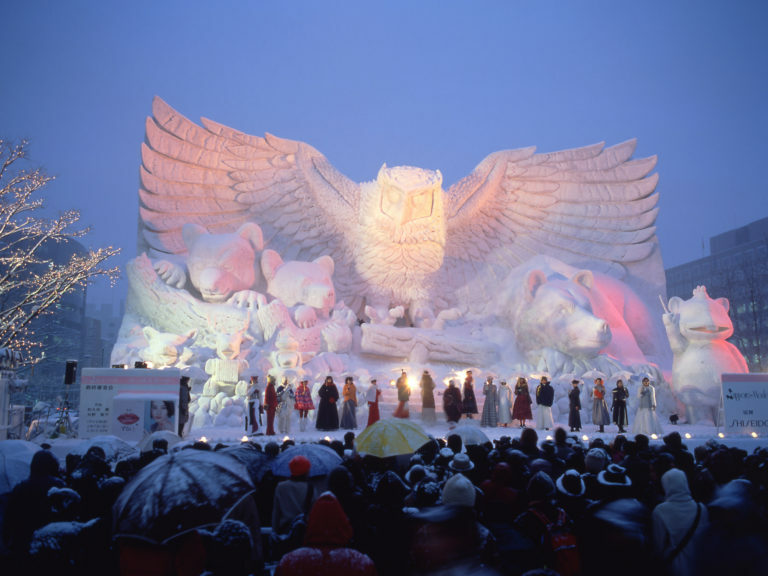 Sapporo Snow Festival with its giant snow/ice statues is a must see in Sapporo city! April 7°C (45°F) Period for rafting. Period to watch brown bears, seabirds and whales during local sightseeing cruises. The peak of cherry blossoms in Hokkaido is expected in early May. Viewing spots include the countryside, mountains and parks. Sapporo Ramen Show in Sapporo city. No rainy season on the contrary to the rest of Japan. Great season for hiking, savouring Yubari Melon, and watching brown bears, seabirds and whales during local sightseeing cruises. No rainy season on the contrary to the rest of Japan; relatively low humidity and no/few typhoons (though climate change may have a negative impact). Considered the best season for hiking. Period to savour Yubari Melon, see big fireworks, and watch brown bears, seabirds and whales during local sightseeing cruises. 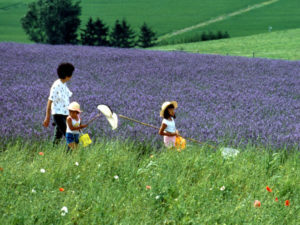 Furano lavender fields in full bloom. Many festivals at ports to pray for rich & safe fishing. August 2°C (36°F) Period to see big fireworks, and watch brown bears, seabirds and whales during local sightseeing cruises. Autumn starting around mid-September. Great season for hiking, trekking, cycling, driving long distances, and watching brown bears, seabirds and whales during local sightseeing cruises. Red, yellow & orange autumn leaves cover Hokkaido, starting at the top of the highest mountains. Coral-grass turning red in Abashiri area. 15: Ashiri Cheppu Nomi ceremony in Sapporo city during which the Ainu pray for salmon. 23: Kotan Festival in Asahikawa city during which the Ainu pray for nature. Autumn leaves until mid-October. Period to watch brown bears during local sightseeing cruises. Marimo Matsuri festival at Akanko Onsen. WINTER November 5°C (41°F) Period to see tancho cranes. 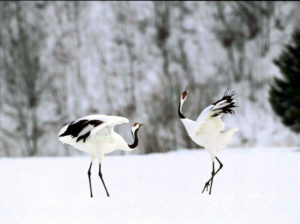 December -1°C (30°F) Period to ski and see tancho cranes. Prices vary a lot depending on places but hotel rooms, food and drinks tend to be cheaper than in Tokyo metropolis. Also note that the prices of hotel rooms vary with the seasons; your stay may cost more during popular periods e.g. Sapporo Snow Festival and koyo (the local period of beautiful autumn leaves). Reserve early to get much more affordable deals for your lodging during the high seasons! Foreigners shopping in Japan can benefit from the Japanese tax-free system. Check up-to-date information about the procedures and benefits of tax-free shopping in Japan before travelling. To reduce your transportation costs, consider buying a convenient and cheap Hokkaido Rail Pass. Visit Akan-kohan Eco-museum Centre for free and add a few hundred yen if you are near a nice museum: 600 yen entrance fee for the Volcano Science Museum, 750 yen for Okhotsk Drift Ice Museum, 800 yen for the Ainu Museum Poroto Kotan… Children get discounts everywhere! To easily grasp the prices, think 10 dollars for 1,000 yen. To avoid surprises, use a currency calculator when finalizing your budget and making your reservations. You can target a daily cost of 2,800 yen for a guest house room and 2,000 yen for two meals. Travellers with dietary restrictions (Muslims, vegans, vegetarians…) may have to add a few hundred yen! You can target a daily cost of 9,000 yen for a night at a business hotel and 4,000 yen for two meals with drinks. AT EASE WITH YOUR BUDGET? You can expect a daily cost of 20,000 yen for a top-end hotel room and 6,000 yen for two meals with drinks.